by Ed Kasper LAc. Acupuncturist, (now retired) Herbalist, & HomeotoxicologistKombucha Brewer since 1995. I am presenting this article simply to address some concerns that every home brewer should be aware of. Kombucha tea has been made for thousands of years. It is safe and healthy. Matter of fact kombucha is almost fool-proof. Almost, but not quite. The CDC and the FDA and Cornel University Food Science all found Kombucha Mushroom Tea to be safe when properly fermented. Brian Nummer (Utah State professor) wrote a very informative article on the FDA kombucha Brewing guidelines. Kombucha Mushroom Tea is a simple beverage made with tea (camellia sinensis), sugar and the SCOBY (probiotic bacteria and yeasts). To make kombucha its as easy as boiling water, add sugar, add tea, cool, add SCOBY, cover and wait a few days. On day one of the process the pH of the tea is just under 6.0. Just your basic cup of tea and sugar beverage with a lot more sugar. Each day the pH drops slightly as the sugar is being converted to beneficial acids and nutrients becoming slightly more sour each day. According to research Kombucha tea should be fermented to a pH of 2.5 to 3.0. While a LAB-ferment the ph should be between 3.6 and 3.9. (a pH below 3.6 may result in the demise of many of their beneficial microorganisms associated with a LAB ferment.) Lactic acid and the polysaccharide and minerals are expected to keep LAB ferments safe, while aceto-ferments rely upon the acetic acid. While an under-fermented probiotic may harbor pathogens or fail to develop the beneficial nutrients, an over-fermented probiotic (higher in acetic acid) may overburden the stomach?s digestive juices. Here's why. The acidic pH aids the stomach?s digestive juices and helps break down food and relieve stagnation. Acetic Acid from Kombucha and Lactic Acid from kefir are all weak acids. When ingested, they react with minerals such as Calcium, Sodium, Potassium and Magnesium in the body tissue and blood, to form alkalies. This reaction is termed Alkaline-forming foods. That is how an acetic kombucha tea actually helps alkalize the body. However you have to be very careful in not over doing this. An excess will rob your body of ionic minerals. A cup or two is fine, but large amounts of these acids are not a good idea. How much is too much? It is a relative term. For a normal healthy adult the amount is thought to be 4-8 fluid ounces daily. (see Drug interactions). This amount appears to be comparable to another popular folk remedy - Apple-Cider Vinegar. The most often repeated recommended dosage for ACV is one spoonful daily. The reason is that typically ACV is 5 % acetic acid - almost 5 times that of Kombucha Tea. There are other differences but our focus here is on the acetic acid. Kombucha tea is far less leeching (a common AMA complaint) and kombucha, because it is alkaline forming, will not create acidosis in a healthy individual. If it does it is far more indicative of a deeper more serious disorder. note that the caution on acidosis, and possible bad lactic acid have never been linked to Kombucha Tea. (see the FDA and CDC and not all kombucha tea contains lactic acid. If it does it is in the form of D-lactic Acid (+). see Kombucha and Body Building below. The CAUTION is to be careful in not over doing this. Drinking too much Kombucha Tea, or over-fermenting your Kombucha Tea will rob your body of ionic minerals -- if in excess... That balance is individual specific and a great many factors have to be considered before one could make a proper determination. These conditions are not limited to Kombucha Tea. But apply to any food ferment. Similar to the same cautions of properly preparing raw foods. These are not "Health Risks" they are "How To safely make ..."
Kombucha is completely safe and ant-pathogenic when properly fermented. A simple pH test strip may be used to the determine proper pH. While the pH reflects the hydrogen and not the acetic acid level it is a easy and simple indication. A sour or vinegary taste is an indication as well, however with proper fermenting one may achieve a less sour more pleasant kombucha tea with a low pH. Even when attacked by mold, kombucha is not a major health risk. It should be considered as one considers other mold-food items such as that found on bread, cheese and other food. The mold will look the same. FUZZY. Mold may also be DRY and DUSTY. It starts in small circles growing outward in the areas that are just outside the reach of the acetic acid. Splashing the Kombucha Tea on top of the mold (pathogen) destroys or displaces the pathogen. If the Kombucha Tea is sufficient in acetic acid than the pathogen will perish. Even if not completely destroyed these pathogens may not present any greater danger then already exists and in which our immune system already deals with. Now of course those with a compromised, weak or not yet developed immune system mold does present problems that may linger or not even appear for years later. Visit our Kombucha Gallery to view what is good and what is Bad. In the beginning stages of the kombucha ferment the new kombucha baby forming quite frankly looks ugly - and looks like its mod. I have posted several pictures of developing kombucha as well as actual mold in our research section and I advise a newbie to browse through the many kombucha pictures. Feel free to contact me or email me a picture to help determine if your kombucha mushroom is doing fine or not. In the beginning this may be challenging, but as time goes on much easier. Plus since each ferment produces a new mushroom, when in doubt one throws the suspect out and starts over with one of their spare mushrooms. 2) Wild & Airborne Bacteria and Yeasts Certain bacteria and yeasts that do not appear as mold may inhabit your ferment and cause problems such as thin, flakey or dusty mushroom, or no mushroom at all despite what appears to be a otherwise good brew. Another problem associated with wild or unwanted bacteria and yeasts is an off flavor or odor. Just the appearance of a otherwise healthy looking mushroom does not necessarily mean a good kombucha mushroom. Candida krusei (Issatchenkia orientalis) and Pichia membranifaciens also forms a mushroom. As does Lactobacillius. Aerobic yeasts, like Picia results in loss of alcohol with production of acetic acid and a sauerkraut off-flavor. A rotten-egg, cooked cabbage aroma or a medicinal taste may reflect the ferment going off and is certainly undesirable. This may develop due to poor dissolved oxygen quality of the water or sulfur in the water, or introduced by adding fruits, sugar, honey and nuts into the ferment. One of the roles of the kombucha mushroom itself is to provide the ?DNA? or blueprint for the bacteria and yeasts to grow and multiply and to produce what we desire in our kombucha mushroom tea. Therefore even though a "ugly" looking mushroom may produce fine kombucha mushroom tea, the appearance in size, form, color and texture does reflect what is happening within our ferment and can be an accurate reflection of our brew. See our collection of Kombucha Mushroom Pictures. Certain characteristics, that may only happen once and not again in our ferments are simply forgotten and we move on. Other times like producing a consistent nail polish remover brew may be associated with certain activities that are detrimental to our ferment. We discuss those issues at greater length in our article on Kombucha off-ferments. Just because these things do happen (in any home ferment like beer, wine, and vinegar making) they are not all that common and do not pose a danger or threat. It is my opinion not to take any chances and when it doubt throw it all out. Its easy and simple to start another one, and the cost of a good organic brew is typical less than $2.00 a gallon! days of every fermenting cycle (until the proper pH has been attained) the safest and easiest way to protect your Kombucha Tea is the Continuous Brewing Method. Optimum temperature 74F - 84F (23-29C)Temperature as well as Time play a vital role in the balance, taste and health of our ferment. Temperatures under 60F (16C) are not recommended and usually lead to a contaminated or off-ferment. options to control temperature. The optimum temperature range for making kombucha tea is between 74F (23.5C) and 84F (29C)This range reduces the risk of mold forming. This range is suited for the probiotic yeasts working with the probiotic bacteria. (SCOBY). It is suited to produce a more reliable consistent brew each time. A kombucha may ferment and produce good kombucha tea in temperatures other than this range but the brew tends to be more unpredictable. Lower temperatures may foster less favorable (or pathogenic) bacteria and yeasts. For more information and charts on the influence of Time and Temperature on a kombucha ferment please see our articles in our Kombucha Research Center. Turbatrix aceti (Anguillula aceti) a minute nematode found in vinegar and sometimes occurring in the urine of patients who have used vinegar douches. It may also occur in sour paste and fermenting vegetable substances. These "little eels" were first seen in vinegar by Leeuwenhoek a French chemist. These eels were detrimental to the vinegar fermentation process because they interfered with Mycoderma aceti, the vinegar-forming organism. In 1863 Napoleon III personally commanded Louis Pasteur to investigate this disaster in the wine industry which threaten to upset the whole French economy. Pasteur found that he could tell by microscopic examination whether the wine had spoiled even without tasting it. The trick was again the identification of disease-producing organisms. And the solution to the problem was elegantly simple: Heat the fully fermented wine gently to kill off the bacteria. Dubious but desperate, the vintners tried the method. Thus pasteurization was born, in wine, not milk. Neither the French, the American FDA nor the CDC consider vinegar eels a health hazard. There are bacterial rails or turbity of the brew that may initially appear as an eel infestation but aren't. Rare, but not uncommon vinegar eels may suddenly appear in a kombucha ferment. They are extremely tiny but visible with a good eye. They will move towards a narrow beam of light if in a darken room. Filtering and straining may remove them. But they may be in the mushroom itself. They feed on the cellulous that forms the mushroom or the lees (yeasts sediment). The mushroom will quickly deteriorate, peeling and easily falling apart. Normal mushroom are tough and quite dense. In our opinion it is best to throw out the entire batch and start fresh. Since vinegar eels are comfortable in vinegar cleaning your equipment prior to starting anew is not advised. They are tolerant of low levels of alcohol as well therefore if such an infestation does occur we recommend a complete sterilization or the use of a Iodophor Sanitizer which is widely used by the home beer and wine making industry. Iodophor is often used by home brewers to sanitize equipment and bottles. This feature is important because kombucha and other ferments rely upon the health of specific bacteria and yeasts while still having the necessity to eliminate other either competing bacteria and yeasts, wild airborne yeasts and bacteria or pathogens. This is a major advantage over other sanitizers that may leave toxic residues. It is also non-toxic to humans and therefore especially suited to food processing applications. Begin slowing drinking only a few ounces a day until one's body adjusts. This is true for all live probiotics. [IMHO, to be a probiotic (pro = in favor of, biotic = life) then it should be alive and in favor of life, not seeking to destroy life as in anti-biotic. In very rare instances a true allergenic reaction may occur. More likely if there is any negative reactions it is a "healing crisis". These cold and flu-like symptoms (red eyes, tearing, reddening of the skin and skin rashes) are viewed as the body detoxing and the general advice is to drink more water. Other common symptoms include stomach rumblings, gurgling, diarrhea or constipation, again viewed as a body adjustment and expected to go away within a few days. While the vast majority of kombucha tea drinkers experience a euphoric feeling, some experience just the opposite. A real tiredness and have to sit down and rest awhile. Some people report quite strong reactions. A true allergenic reaction will not go away as long as the allergen is present. If you do suffer or believe you may be experience an allergenic reaction simply stop. If the symptoms go away but come back when you begin again you are allergic. Some, a few, have been able to make a nosodes of kombucha tea (or other allergen) and found relief of the allergy and be able to drink kombucha tea there-after. Kombucha Capsules and Kombucha Homeopathic Remedies are also available and preferred by many, though in my opinion kombucha then tends to be more like a medicine than a healthy food. I seem to be one of the few who do not recommend Kombucha Tea during pregnancy or breastfeeding or for babies under the age of 4. Probiotics may be found in breastfed infants and help provide natural protection against many diseases. Most often, the bacteria come from two groups, Lactobacillus or Bifidobacterium. Within each group, there are different species (for example, Lactobacillus acidophilus and Bifidobacterium bifidus), and within each species, different strains (or varieties). A few common probiotics, such as Saccharomyces boulardii, are yeasts, which are different from bacteria. 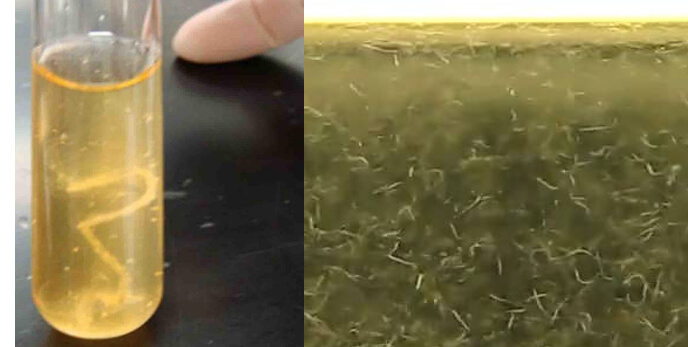 These probiotics may also be found within a typical kombucha ferment. However effects found from one species or strain of probiotics do not necessarily hold true for others, or even for different preparations of the same species or strain. Care and preparation of a kombucha ferment is more critical at this time. Wild and airborne bacteria and yeasts which may (probably do) inhabit a typical ferment and which does not present any threat to a healthy adult may be intolerable to those certain circumstances. Probiotics do have a long history without causing illness in people, and have recently been introduced in foods directed at helping certain disorders. However more information is especially needed on how safe they are for young children, elderly people, and people with compromised immune systems. One special concern is using "raw" honey, as honey is often used to ferment kombucha (or to make honey-mead) and also given to babies to quiet them. Clostridium botulinum spores in raw honey have resulted in infant botulism. As mentioned under-fermented or over-fermented probiotics are not harmful for a healthy adult but could be a risk for compromised individuals - or those in a weak and feeble state or those without their own immune system. Symptoms begin 18-36 hours after ingestionInfant botulism is due to C. botulinum. The disease occurs in infants 5 - 20 weeks of age that have been exposed to solid foods. It is characterized by constipation and weak sucking ability and generalized weakness. C. botulinum can apparently establish itself in the bowel of infants at a critical age before the establishment of competing intestinal bacteria (normal flora). Production of toxin by bacteria in the GI tract induces symptoms. This "infection-intoxication" is restricted to infants. C.botulinum Survives boiling for over one hour.Grows best in neutral or "low acid" vegetables (>pH4.5). Another concern about giving kombucha tea - or any fermented food - is that the food be properly prepared. In investigations by Cornell University Food Science (cited above) and in the Minnesota Department of Agriculture Pickle Bill Fact Sheet outlines those concerns and provide easy to use guidelines for home-made ferments. My caution is that those guidelines apply to the average adult population and not to children under the age of 4 who are in a special class. Children under 4 do not have a fully function system. It is still in the critical development stages and children should not simply be considered "miniature people". Where C.botlium or e.coli may not present as a threat to the average adult they may be a serious threat to an infant or small child. For example in Cornell's test kombucha tea was observed to be anti-microbial in their fermented samples containing 33 g/L total acid (7 g/L acetic acid). Yet e coli, will grow albeit slowly at acetic acid concentrations of 3?4 g/L. (R.Cortez Garcia, et al 2006). At what point does a home-ferment reach a safe stage? As described by the Pickle Bill a simple pH reading is usually sufficient. However they do caution that different fermented foods have different readings. And that the common paper pH strips are not recommended because they are difficult to read, suggesting that a digital pH meter be used. In our experience we have found that the pH range can be quite large and just relying on taste to be inaccurate. While taste (semi-sweet-semi sour, hint of vinegar, slight aroma) is acceptable for healthy adults it is totally an unacceptable determination for the safety of kombucha tea when given to children. Even the pH may be misleading as to the acetic acid content. For instance Bragg's Apple Cider Vinegar lists acetic acid of 5.14 % with a pH of 3.075, while Cornell listed their average ferment of acetic acid of 0.07% with a pH of 2.5. Cornell also noted that the ferment should not be allowed to go overly long and where the acid levels may be too high. the CDC who investigated an Iowa women and kombucha tea concluded " Drinking this tea in quantities typically consumed (approximately 4 oz daily) may not cause adverse effects in healthy persons; however, the potential health risks are unknown for those with preexisting health problems or those who drink excessive quantities of the tea." As explained above Acetic Acid from Kombucha and Lactic Acid from kefir are all weak acids. When ingested, they react with minerals such as Calcium, Sodium, Potassium and Magnesium in the body tissue and blood, to form alkalies. This reaction is termed Alkaline-forming foods. That is how an acetic kombucha tea actually helps alkalize the body. (Since Kefir is a milk ferment this is a not an issue here). However, Kombucha Tea in pregnant, nursing and with babies where normal demand for these minerals are higher the issue is critical. The same warnings are applied to Soy Milk and Soy products. Kombucha Tea and Soy products deplete calcium and may reduce the thyroid function, and therefore are not advised to be given to children. Adults, for reasons cited above, are not at such risks. You may be able to test these levels yourself at home with a Lactic Acid test strips or pH strips or a meter. However "normal" may change several times during a day and with only a few readings one should not draw conclusions too early but rather over a longer course of time. My concern here is not just a balance but one of maintaining a "difficult balance"
Alcohol, sugar and caffeine are all things that children should avoid. Kombucha Mushroom Tea has various amounts of alcohol. The typical amount is 1/2 of 1%. It does depend upon the length of ferment and other factors. In the early days (day 2-3) or in a cooler temperatures, the alcohol content will be higher with the highest level about 4%. The longer the ferment the less alcohol and the less sugar. But always some alcohol remains. Likewise sugar will always be present even in a 30+ day ferment. Residual sugar will mainly be in the form of fructose and pentose. (typical 4%). Sugar and alcohol levels may be measured by a hydrometer. Caffeine levels are determined by the specific tea (Camellia Sinensis) Typical kombucha tea will have 25-40% of that listed for the particular tea per serving. For example if a typical cup of black tea has 100 mg of caffeine per 8 oz cup than kombucha tea will have 25-40 mg of caffeine per 8 fl oz. Longer brewing times will reduce the caffeine level only about 1%. Contrary to popular belief White Tea does not necessarily have less caffeine than other teas. For more information on teas and a simple home method of decaffing your own tea and test results showing caffeine levels of For a normal healthy adult these levels are not problem and actually are beneficial. Yet for many alcoholics, diabetics and those with severe caffeine sensitivity those levels are still too high or have to be carefully monitored. In TCM Kombucha Tea like Chinese herbs play an important role in helping the body to maintain the proper balance and health. Breast Milk is a product of he mother?s blood. Herbs that affect the blood will also affect mother?s milk (as well as the mother herself). Chinese herbs may inhibit or stop lactation. One herb - depending upon the dosage will do either ! Ginseng may cause more heat in the milk. Vinegar will sour milk. The intervention of herbs (foods) is dependent upon the specific balance of the mother at that time. Herbs, applied in a TCM sense, are neither good nor bad ? they are applied in conjunction with an individual, that together affect a condition. Since the Chinese physicians First Duty is to Do No Harm, then the warning is not to give herbs unless specifically called for. When appropriate TCM herbal remedies, in my opinion, is often superior to their western counterparts. At this time of development TCM seeks to build and strengthen the mother. Through the mother the fetus is strengthen. The image is one of creation and building. Such as that created by Kefir and Caspian Sea Yogurt or Viili. Good, nourishing wholesome foods. Kombucha Mushroom Tea, on the other hand, breaks stagnation and moves the blood. Kombucha is invigorating. Excellent for those people with a lot of phlegm and stagnation and toxins built up over the years. Not good for pregnancy - which is viewed as a form of stagnation in TCM. One does not want to "purge" a fetus. Additionally as a "detoxifier" Kombucha releases all those stored toxins. Where do they go? In normal healthy conditions they are expelled through the urine and stool. In a dehydrated individual they may be forced out through the skin, nose or eyes, or possible to the fetus or suckling baby. Kombucha has a sour aspect to it and will cross over to the mother's milk and sour the milk, possibly moving those toxins out that route as well. Diarrhea, all too common in babies may be made worse by kombucha tea. Diarrhea is a primary cause of dehydration. Dehydration which happens quickly is a major medical concern and must not be ignored. Stomach gurgling and unrest is a common short term experience to many new to drinking kombucha. This may be related to the specific strain of bacteria and yeasts in the kombucha ferment. Some studies have indicated that different strains of bacteria affect the liver and gallbladder in slightly different ways. This could explain why some people have a problem while others greatly benefit. Not all kombucha ferments are the same, so if one brothers you or you are not getting the effects you want try switching. In new borns and babies their digestive tract is just developing and the live active raw nature of kombucha may over whelm their fragile system. Kombucha "invigorates the blood" a TCM term and in my experience has had some adverse reactions with blood thinning drugs like coumadin. Kombucha has been reported to lower blood pressure as well and several people have told me that they experience a light-headed or slight "buzz" as if drinking a glass of beer or wine and question the alcohol content. (all test indicate a low value of 1/2 of 1%) Some people have reported feeling dizzy to the extent that they had to sit down and rest. This should not be confused with a nice relaxing experience. Kombucha does seem to help people with HYPER-tension. Headaches, may be attributable to tannins, like tannins in red wine are a common source of headaches to those that may be sensitive. Acetaldehyde (see below) can cause sweating, rapid pulse, skin flushing, nausea, vomiting, and dehydration. These are typical of a hangover or a slight buzz. Tannin sensitivity may be determined by making a strong cup of tea. Your tongue develops a "leathery" feeling in reaction to the tannins. Most people find tannins very agreeable. Though now I suspect it may not be well suited for those with HYPO -tension or those with Hypo-thyroid related disorders. Expectant mothers and nursing mothers whose bodies are already stressed may be pushed just a little to far by the otherwise slight adverse reactions of the kombucha tea. Some of these affects may be moderated or eliminated by combining Coral Calcium plus Kombucha Tea as recommended by Dr Robert Barefoot in his book "The Calcium Factor". Kombucha is viewed as an immunity booster. Which assists a weak system to overcome a pathogenic influence. However in a new born and in babies - whose system is non-existent or fragile - may end up relying solely on the protection of kombucha. Years later when challenged the body will not have developed those defenses of its own and end up compromised. One's immunity system is built up (created) by stress caused by exposure. If one seeks to help a child build natural immunity one nurtures the Childs own ability and not to develop a dependency on outside influences. Instead of the child naturally fighting the pathogen, the kombucha fights the pathogen. This belief has been almost universal in the alternative health field. Now this view, referred to as the " hygiene hypothesis" is gaining a lot of support in western medicine. Notable institutes like National Institute of Allergy and Infectious Diseases, and the Henry Ford Health System in Detroit, and numerous articles in The Journal of Allergy and Clinical Immunology. The hygiene hypothesis proposes that unless children's immune systems fight infections by themselves early on, they can go into overdrive later and cause allergic reactions. According to recent (2004) research, babies (in their first year) who are allowed to develop their own immune system are far less likely to get allergies or asthma latter in life. If and when intervention is warranted we suggest to consider Homeopathy. It is safe, effective and works fast. I do recommend and use herbal formulas but I find, as in the case of my own daughters (age 4 and 10) that they greatly prefer homeopathy - they will even ask for it. One fairly pleasant herb great for children is Elderberry - a herb often added to kombucha for both flavor and health. Kombucha is Qi. Energy and Yang. It is Yang within Yang. A catalyst. Kombucha makes things happen. For most people, who are Yang Deficient and clogged with toxins, kombucha is perfect. For children who are Yang Excess and predominately Yin Deficient, kombucha poses a risk of upsetting a delicate newly developing balance. Kombucha will tend to make a child more hyper-active. The child will get more colds and flu (average child ha 4-10 colds per year) with higher fevers and will tend towards more skin disorders and asthma. (TCM Lung disorder). Many people believe kombucha is an immune-booster, and where it does benefit a otherwise healthy adult, in a child with a Wind Heat (TCM condition, Cold with chills, fever and sore throat) kombucha will exhaust the Qi (energy of the body) resulting in higher fevers, fevers that linger, and fevers that come and go. Kombucha is a diuretic (makes one pee) which furthers depletes the Yin and dehydrates the body. The child?s dehydration (Yin Deficient in TCM) is accepted by western medicine as one of the leading causes of childhood diseases. I always ask a parent "Why, do you want to give kombucha tea to your child?". The most often answer is that it is healthy and full of vitamins and minerals and good stuff. Well, yes and no. Kombucha does have good stuff but the water soluble vitamins and minerals is limited. This is followed by "because they crave it" and really like it. My answer is they like candy and chocolate too, but don't give it to them. There are far more healthy and nutritious foods available. There are times when I will suggest kombucha tea or kombucha extract for a child. In those times it is meant for a specific TCM intervention just as I would recommend herbs or other treatment protocols. I recommend Kefir and Milk ferments for children. Raw or Organic milk only for children. Store bought-milk may be feed to the probiotic, as probiotics turn any milk to real food, even some lactose intolerant people can drink. [NMSU College of Agriculture & Home Economics] Guide E-507 by Alice Jane Hendley. Probiotics shouldn't affect the elimination of drugs from the system. Certain compounds found in Kombucha, such as caffeine etc., may interfere with the absorption of certain drugs and Acidic foods weaken the affect of Antibiotics drugs. It's a good idea to partake of your Probiotic an hour or two before/after the medication. The thick YIN nature of Kefir and Caspian Sea Yogurt work to rebuild the GI track with healthy vibrant microorganisms, these microorganism smother the antibiotics (antibiotics indiscriminately kill both good and bad flora) and help re-establish the flora after vaccinations and antibiotics. Kefir has recently been studied for its effectiveness against H. pylori. Drugs are extremely powerful and force the body to do unnatural things. Drugs are toxic and kill. That is what they do. That is how they save lives. Recently they have found that drugs may combine with chlorine in tap water, as well as lead that is still in some old pipes in our drinking water, and form more toxic material. If you're on blood pressure meds or corticosteroids reduce the amount of kombucha tea. If you're on blood thinners be careful and monitor your position. IMO, kombucha and Coumadin should not be taken at all. (although I have known of many kombucha drinkers who were on Coumadin and had no problems, still I'm against it because I have known some who have had problems.Do not take penicillin with Cola?s. Cipro (fluoroquinolone) an antibiotic, when taken with calcium supplements, renders the drug unavailable to the body. Plendil (felodipine) a blood pressure drug, should not be taken with grapefruit juice. Coumadin (warfarin) do not take with fish oil supplements and /or green leafy vegetables, or with Kombucha Tea. When on Chemotherapy do not eat homemade celery soup with parsnip and parsley (contained compounds called psoralens,) in large quantities can cause extreme reactions when sunlight hits the skin. Within 60-90 days one should expect positive noticeable results from drinking 4-8 ounces of kombucha tea daily . Kombucha helps remove the bad DL-Latic acid (-) created during exercise. AND Heavy metals ...go down the toilet. Urine tests showed that after drinking Kombucha Tea, urine contained considerable traces of environmental toxins (such as lead, mercury, benzol, caesium, etc...). which Kombucha helped release from the body. BUT If the body gets not enough water to maintain the body cells, the intestines will take the water out of the digested food present in the intestines, and be unable to release those toxins. They appear then as a skin rash or cold/flu-like symptoms. Pure Water has been reported to cure many diseases as well as being the number one disease preventative. Probiotics have favorable results with DOGS and HORSES. For CATS kombucha is controversy, as it contains (a precursor for) Acetaminophen (Tylenol) but IMO, very good results have been reported by cat lovers. Our opinion is that it is both safe and beneficial for all animals (and people). Kombucha Authors; Guenther Frank, Beth Ann Petro, Betsy Proctor, Rosina Fasching, Harald W Tietz, and Bartholomew all write about the benefits of kombucha in fighting cancer as well as other diseases. Kefir Grains as well as kefir is enjoyed by many animal pets. I understand that the views presented here are not popular. Indeed I was banned from the "original kombucha newsgroup" for presenting my views. Bev, the list-owner said I was "scarring people". Please remember these comments are not "Health Risks" they are How To safely make Kombucha Tea. In a study titled Probable Gastrointestinal Toxicity of Kombucha Tea published in Journal of GEN INTERN MED 1997;12:643?644, questioned unexplained side effects that may have been related to consumption of Kombucha tea reported by four patients. Two presented with symptoms of allergic reaction, the third with jaundice, and the fourth with nausea, vomiting, and head and neck pain. In all four, use of Kombucha tea was in proximity to the onset of symptoms and symptom resolution on cessation of tea drinking suggested a probable etiologic association. The study concluded that although there was no evidence for the mechanism of side effects, or whether they are related to the Kombucha or to a contaminant, that it was prudent for health care providers to ask questions particularly when patients present with perplexing complaints?. 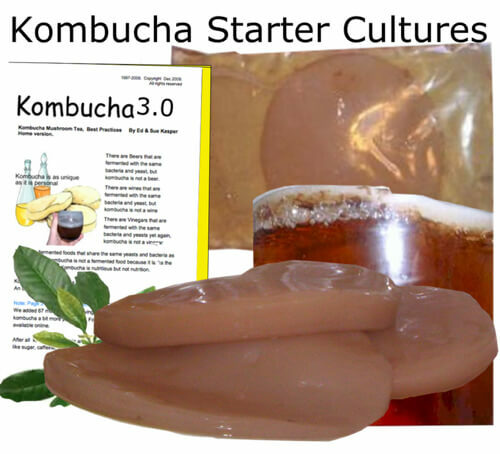 In my opinion it is noteworthy, not only that kombucha tea was not implicated in any disorder - that the symptoms reported are very common symptoms reported by a great many first time kombucha drinkers and often reported by those that have drunk kombucha tea for years and question if maybe it was just that one ferment that had gone slightly bad. It is also important to note that there are over 50,000 annual hospitalization for food-borne related incidences every year in the U.S.
Our liquid extracts are the most potent form of a botanical elixir. The Happy Herbalist?s Pharmacy features fresh-made Remedies Designed Exclusively For You. @ copyright 2007, last update June 2016. www.HappyHerbalist.com all rights reserved.